Intro: In her new book, Taking Aim: Daring to be Different, Happier, and Healthier in the Great Outdoors, hunter and television host Eva Shockey shares the insider stories behind her rise to fame, her passion for bowhunting, and her desire to live organically as she raises her young family. Eva Shockey is no stranger to challenges. For the past 7 years she has traveled around the world in pursuit of wild game (what she considers “the best food on the planet”), enduring the dry heat of a South African safari, the bitter cold of Saskatchewan winters and countless days away from creature comforts. She serves as a brand ambassador for several outdoor-focused companies, including Under Armour Hunt, Cabela’s and Bowtech. She can claim accolades for her service to the hunting community, including most recently the title of “Most Admired Outdoorswoman” from a Field and Stream reader poll earlier this year. Now the 29-year-old Canadian co-host of Jim Shockey’s Hunting Adventures can add “author of an inspirational memoir” to her already impressive resume. 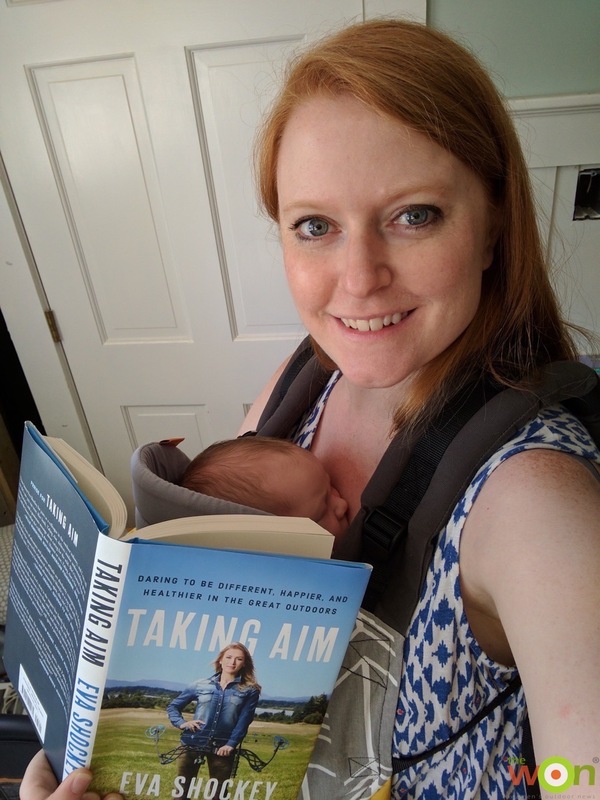 Taking Aim: Daring to be Different, Happier, and Healthier in the Great Outdoors provides readers with an honest, reflective look at Eva’s life from her early childhood to the birth of her daughter, Leni Bow, last January. Throughout the book, Eva shows that while she may be many things – a hunter, a television host, a millennial, a new mom and a health advocate – none of these terms singularly captures who she is or what she believes. 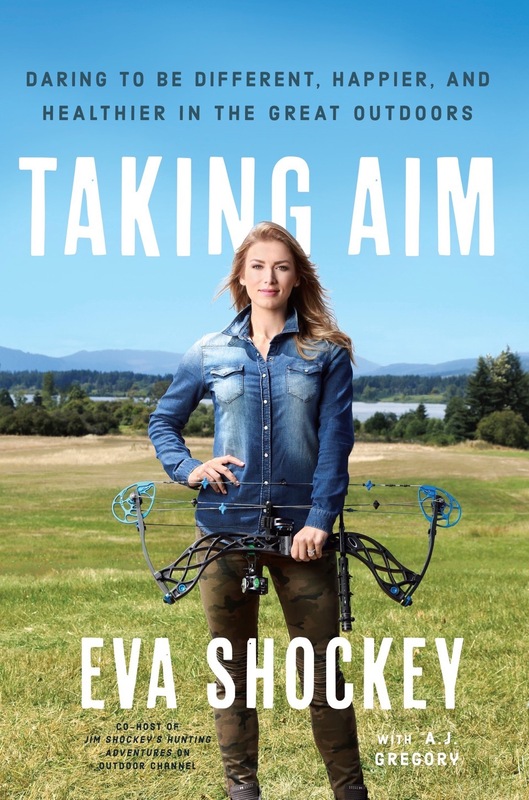 “Everyone who has ever been great at something has had to start from the beginning and work her or his way up,” she writes, and readers of Taking Aim are treated to the tale of how Eva morphed from someone with no interest in hunting into someone who feeds family and friends with wild game she harvested herself. Each chapter offers a deeper look into Eva’s hunting journey. Her dad, world-famous hunter, guide and Outdoor Channel personality Jim Shockey, exposed Eva and her brother to a hunting lifestyle throughout their lives. For Eva, though, a love of hunting did not blossom until after she graduated from college. Despite the “delayed onset” of a love of hunting, Eva’s appreciation for the outdoors is evident from the first page. She credits her parents and grandparents with passing on their love for a life that honors and appreciates all that the outdoors has to offer, including organic gardening. Once she started hunting, Eva dove head-first into it and found that her family continued to offer support and encouragement on her new path. After a discouragingly dull first whitetail deer hunt, Eva writes, “My father tries to paint a different picture of hunting, reminding me that it’s not just about the harvest. It’s about the adventure of being in the center of nature and wildlife and being grateful to be alive.” Throughout Taking Aim, Eva’s family takes center stage as they help her along her path. Interwoven with entertaining family anecdotes and captivating hunting stories are lessons in conservation and personal dedication to a cause. She recalls how her father warned her of the potential backlash she might face as a female in the male-dominated realm of hunting. As she recounts in Taking Aim, Eva’s encounters with anti-hunters shaped her career and bolstered her unapologetic love for hunting and conservation. “If I let negative remarks from people who don’t understand get me down, I am choosing to get in my own way,” Eva writes of a time when she was teased and criticized for hunting. Ever-optimistic, Eva’s stories of triumph over ignorance are encouraging to anyone who faces opposition in life’s pursuits. And if you follow Eva on Facebook or Instagram, you will appreciate the insider look Taking Aim provides into some of the biggest showdowns Eva has had with anti-hunters. Beyond hunting, Taking Aim is about sharing passions with others. From the stories shared throughout the book, the Shockey family appears to be driven by a passion for the outdoors, organic living and togetherness. And throughout Taking Aim, Eva shares her and her family’s passion to live in an optimal way, connected to family and Mother Nature. With wonderfully descriptive language and a great storytelling method that provides new delights page after page, Taking Aim paints a picture of a “life on purpose” that is likely to leave the reader wanting to “take aim” at the thing their heart is calling them to do. The author has a few things in common with Eva. She loves archery and she’s a new mama! I loved reading Taking Aim. The same Eva from television and Instagram was definitely the author of the book, as her voice was consistent throughout. Her action-packed stories made this book a joy to read. With hunting stories interspersed with the details of Eva’s journey into hunting, the book flows well from one chapter to the next. It is a good, quick read; I finished it within a day of receiving my copy. One of my favorite aspects of the story was the relationship between Eva and her dad. 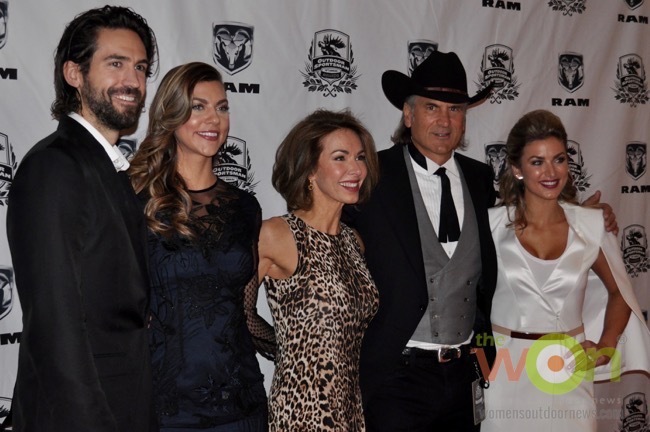 Jim Shockey is a resource for hunting knowledge and encouragement over Eva’s life. The dialogue between father and daughter reminded me of an episode of Jim Shockey’s Hunting Adventures titled, “No Guff!” Their exchanges were often educational, sharing information on hunting, wild game and conservation. Eva does a great job sharing her hunts in the book. I eagerly followed along, from warthogs to Yukon bull moose, and I cheered her on when she dealt with anti-hunters in a classy way following a North Carolina black bear hunt. Each hunt is described in the present tense, and whether it was a slow-going whitetail hunt or a fast-paced shot at a caribou, Eva did a great job helping the reader feel what she felt in the blind and behind the trigger. It is hard to find negative things to say about Taking Aim. I feel inspired after reading it to get prepped for the fall archery hunting season. Especially since I shoot the Eva Shockey Signature Series bow by Bowtech, and it has freshly fletched arrows ready to fly. I do wish there was a little more detail included in the book about the development of that bow, since I think it is great to shoot. Otherwise, reading Taking Aim did not disappoint. 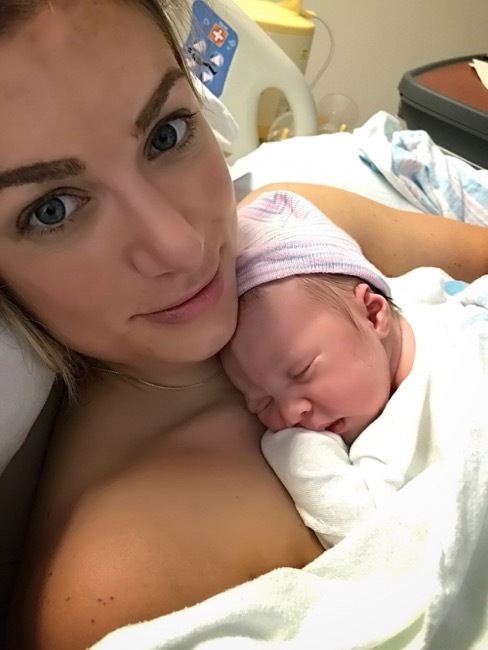 Like Eva, I am a new mom, and though I know I won’t get out in the woods as often as I did last year, I look forward to passing on a love for shooting and hunting to my son, such as Eva is doing with Leni Bow. Overall, I highly recommend Taking Aim to anyone looking to learn more about hunting or about Eva herself. It is a great story and a great read, and if you’re anything like me it will leave you feeling excited and inspired. Leading up to the release of the book, I got the opportunity to interview Eva. What follows is a question-and-answer format detailing her writing process, the challenges of creating a book, and what is next for the dancer-turned-hunter-turned-author. EHM: Your new book is out at the end of the month. How exciting! What inspired you to write Taking Aim? ES: This book was a long time coming! I started this project right after I found out I was due with Leni Bow, and finished writing the month before she was born. Not many people have read it yet, so it’s exciting to be at launch! I host Hunting Adventures and manage my social media pages, and those are all great platforms. But I wanted to write this book because it would be something that my daughter could read years from now. I hope this book is part of my legacy for the next generation. EHM: What was the most surprising or unexpected part of writing a book? ES: What was the most shocking and way harder than expected was providing the details for the book. On the show and in a photo on social media all the details are there immediately. In the book you have to paint the picture from scratch. That takes a totally different skill! I felt driven to get all the details right, which meant a lot of recollecting and researching. If I mentioned the wrong plant in a certain location, or a flower doesn’t bloom during the time of a bear hunt, it’s there forever in the book and someone will catch it! My dad helped a lot with this part of the research. EHM: Your dad seems to play a big role in your life. Can you tell me more about how his lifestyle and mindset influenced you? ES: He definitely does play a big role, but I have to say that Mom does too! My mom is a good balance with my dad. Although my mom doesn’t have the hunting gene, I might not be a hunter if it wasn’t for my mom. Throughout my childhood she would remind my dad, “If someone doesn’t want to hunt, don’t push them!” I am pretty stubborn, so it would have ruined hunting if my dad had pushed me to try it when I wasn’t ready. Thanks to my mom that didn’t happen. Something my dad always emphasizes is that the size of antlers doesn’t matter as much as the experience, and I value him teaching me that. EHM: I love the subheading for this book – daring to be different, healthier and happier in the great outdoors. Can you describe what that generally looks like for you? ES: I did not intentionally set out to be different with hunting. But as a female it *is* different for me. I firmly believe that wild game is the best meat you can eat. You can’t just go buy it at the grocery store, so you have to do things differently! If you want organic meat you have to get it yourself! EHM: People who pre-order Taking Aim get access to some of your favorite wild game recipes. How was the process of creating and sharing those recipes? What’s your most favorite of the favorites? ES: That recipe book is one of my favorite aspects of this book launch. Most of the recipes are a spin on something that my mom made when I was growing up. I have had a few years to tweak them and make them my own, and that’s what I shared. The best part of these recipes is that they are flexible, so anyone can use whatever wild game they have in their freezer. In the future I want to write a whole cookbook! For now this recipe book is there to share the most-requested recipes from social media as a reward for those who support me and buy my book early. EHM: What do you want your readers to take away from this book? ES: I would love readers to feel inspired to take a risk and do what they want in life! ES: There are quite a few projects in the works – most recently the launch of my new bedding line at Cabela’s! They took a chance on me with two different bedding lines and I couldn’t be more excited. The bedding launches in August (see Cabelas.com for details)! And as always you can follow what I’m doing on Instagram and Facebook. I have some hunts and other projects to promote hunting in the works, and I will be announcing things on my social media pages so be sure to follow me.